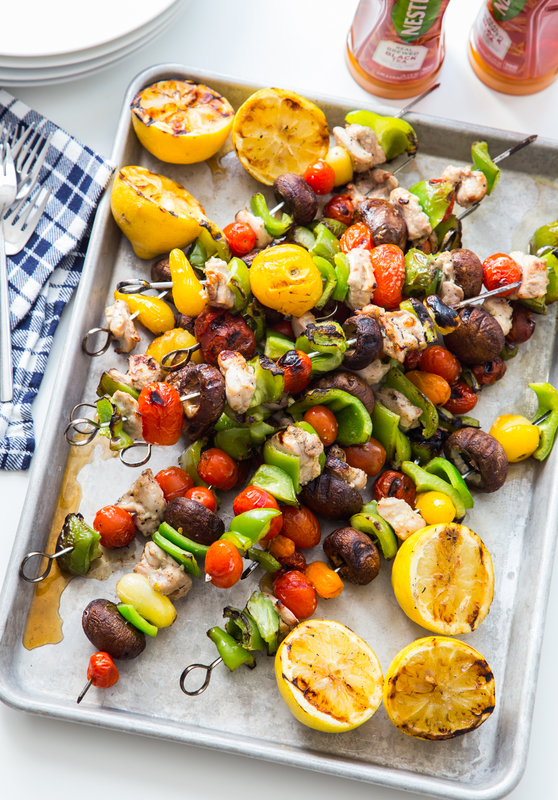 Lemon Garlic Chicken Kabobs is a complete meal cooked on the grill. 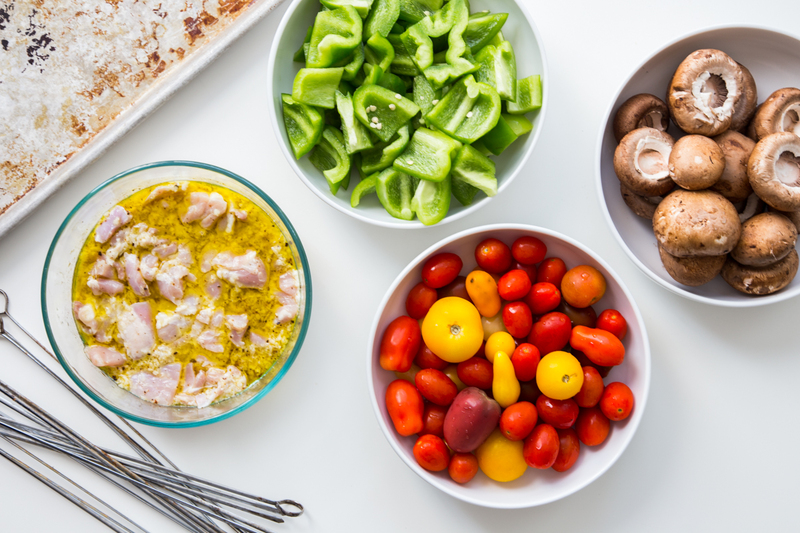 With tender chicken thighs, green peppers, hearty mushrooms, and sweet cherry tomatoes this is a meal made for summer nights. This post, Lemon Garlic Chicken Skewers, is sponsored on behalf of NESTEA. All opinions are my own. My kids have summer legs. You know the kind that are sporting farmers tans, dirt smudges, and a few scrapes and bruises for good measure. They’re like little road maps of their summer adventures. It’s hard to believe they only have about a week and a half left before heading back to school. Summer always tends to be a quiet season around my blog. My days are filled with adventures in parenthood and while our days are highly unstructured, I love to soak up this time with them before they get whisked back off to school. It just makes the kid/work balance tricky and ultimately the kids win out and my little blog goes into a low power mode for the summer. I like to think lots of you are in a similar situation so I think it ends up working out for all of us. That’s one of the main reasons why I love cooking in the summer. I don’t really deal in elaborate recipes because I just don’t have the time or the energy to do so. I like to take a low power approach to all of my summer dealings. Dinners in the summer consist of grilling or breakfast for dinner. Both things require little to no planning. Breakfast for dinner is typically eggs (whichever way I feel like making them) bacon or sausage, and toast. If I’m feeling fancy, I’ll throw in some pancakes. Grilling is even more flexible and if I have a couple of minutes I usually like to throw together some kind of kabob. 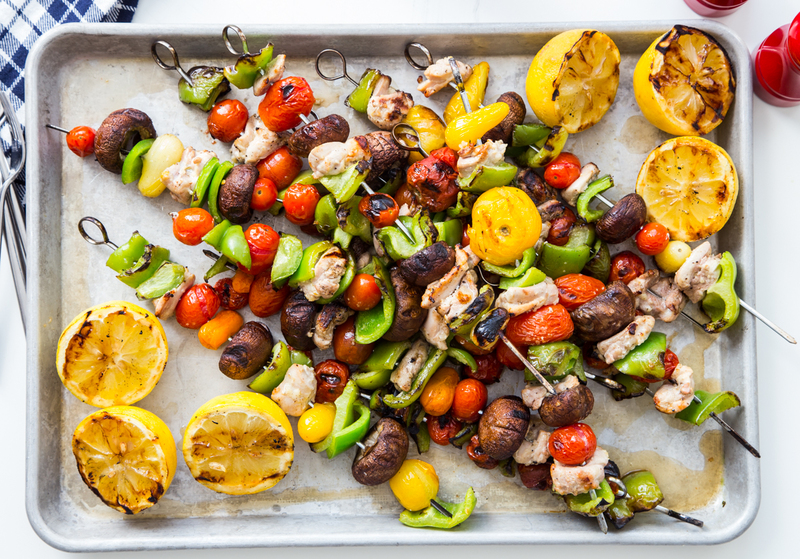 The great thing about grilling kabobs is that you can use pretty much any protein and any vegetables you have in your fridge. 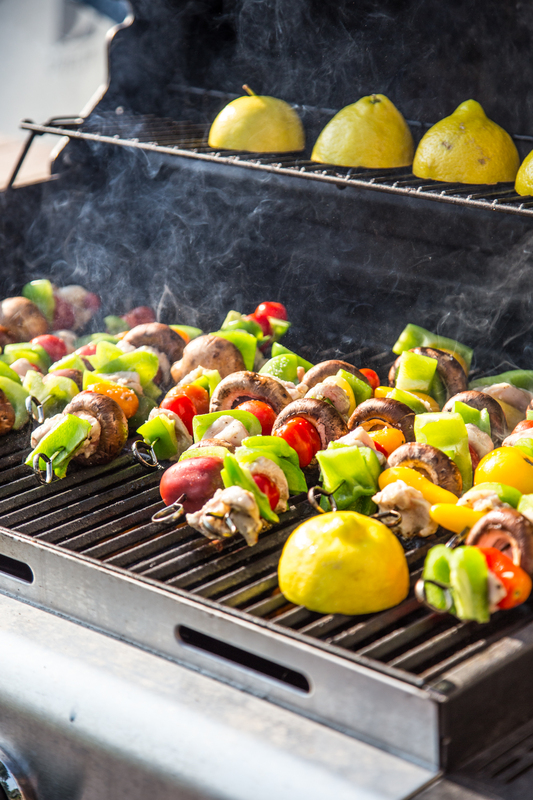 By doing both protein and veggies, you have a complete meal all cooked on the grill with very little cleanup afterward. 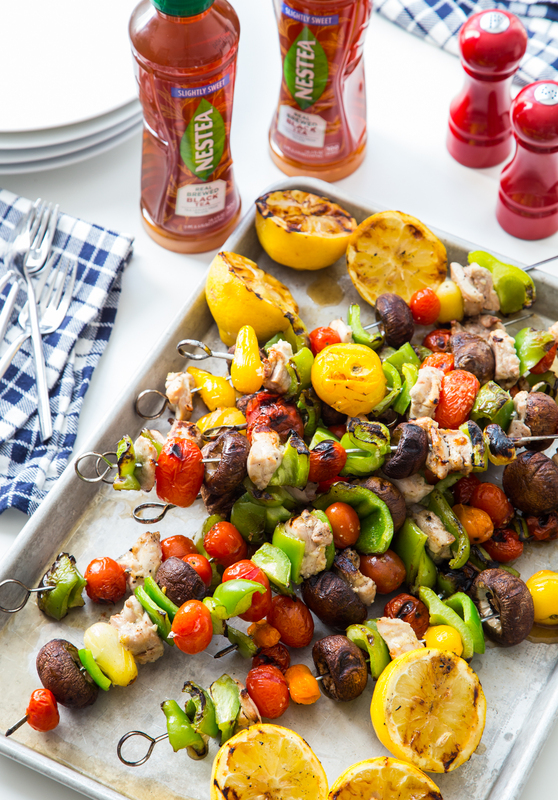 For these Lemon Garlic Chicken Kabobs, I cut boneless skinless chicken thighs into bite size pieces and marinated them for a couple of hours in a lemon garlic vinaigrette to really pack it full of flavor. If you don’t have time to marinate your meat, just brush the assembled kabobs with your favorite BBQ sauce before grilling for some quick flavor. 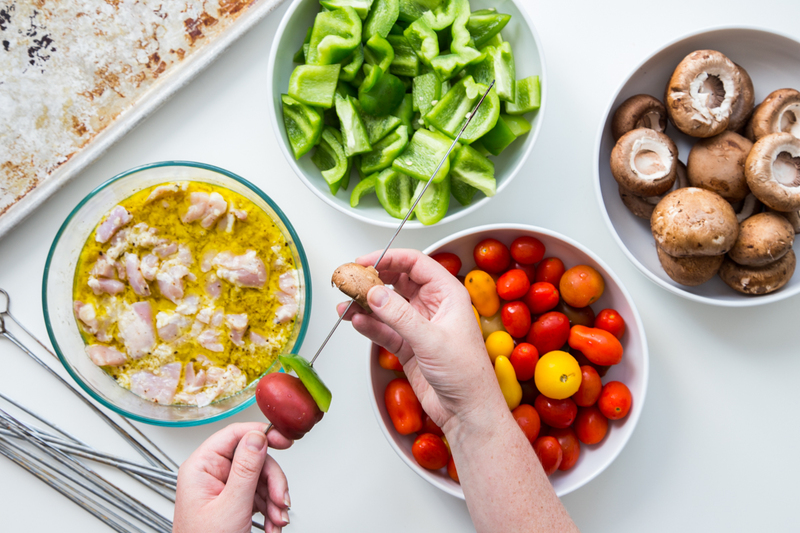 I paired the lemon garlic chicken with mushrooms, green peppers, and baby tomatoes that all got simply seasoned with olive oil, salt and pepper. You can use whatever vegetables you have on hand, which is one of the reasons that I love making kabobs. I threw a few cut lemons onto the grill to squeeze over the finished kabobs and it was just the right finishing touch. When it comes to drinks, my simple philosophy continues. 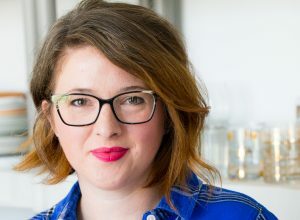 I have been keeping some bottles of NESTEA Slightly Sweet Black Tea in my fridge to grab whenever I am running errands, have friends stop by for a chat, and especially for a little something refreshing for dinner to add something new to our weeknight dinners. 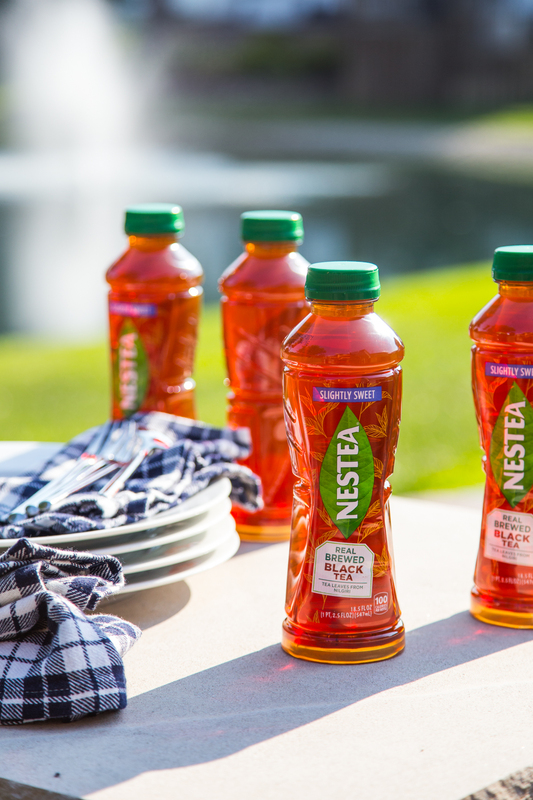 The new NESTEA Slightly Sweet Black Tea is full bodied black tea with just a touch of sweetness. In fact the amount of sweetness in this Slightly Sweet Black Tea is perfect to keep it refreshing but also bring out the flavor of the tea itself without covering it up. 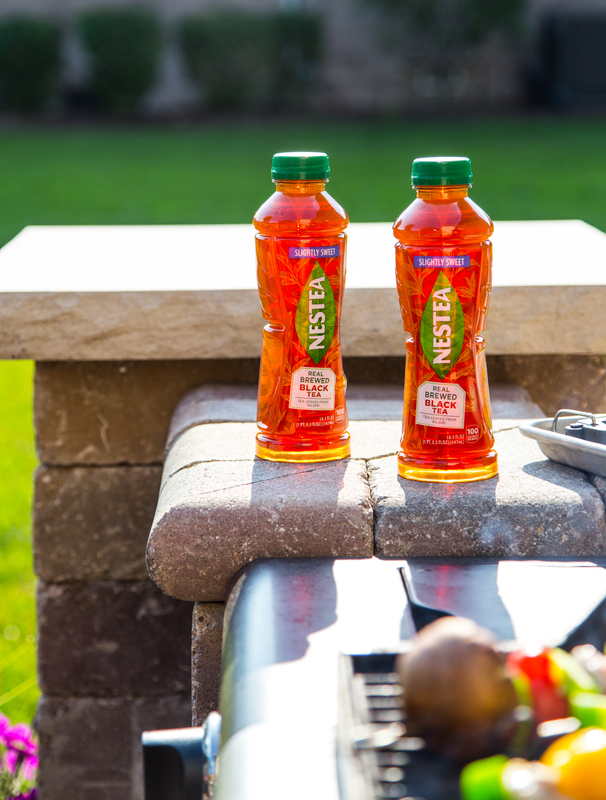 Whether we are enjoying our dinner on the patio or escaping the heat and eating in the air conditioning, having a bottle of NESTEA Iced Tea makes any dinner, no matter how casual, feel special. Does your family love kabobs as much as mine? If so, what are your favorite kabob ingredients? Place chicken in a bowl. Whisk together lemon juice, 1/4 cup of olive oil, salt, and pepper and pour mixture over chicken. Refrigerate for 30 minutes or up to several hours. Skewer chicken and vegetables onto metal skewers. Drizzle skewers with remaining olive oil and sprinkle with salt and pepper. Grill skewers on medium high for about 12 minutes or until chicken is cooked, turning halfway through cooking time. Place lemons cut side down on grill while skewers are grilling. Squeeze grilled lemons over finished skewers and serve. Great recipe! Made it over the weekend for a lunch BBQ and it was perfect! Wouldn’t change a thing. I had some eggplant from the garden so I added that and it was a great addition.